ATLANTA (AP) — Changes are being considered on Atlanta’s offensive line after Matt Ryan was sacked six times in the latest of the Falcons‘ three straight losses. 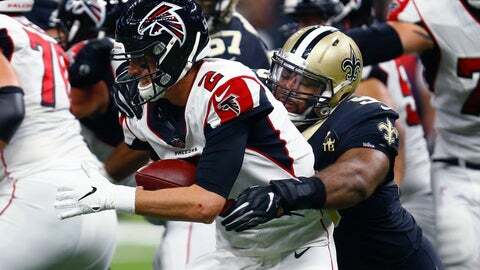 The Falcons (4-7) ran for only 26 yards on 16 carries in their 31-17 loss at the New Orleans Saints on Thursday night. Atlanta was eliminated from the NFC South race and would need a dramatic turnaround to revive its fading wild-card hopes. “Obviously when you have a run game performance like we did, there’s a lot to look at and a lot that needs our attention because that was considerably below the line,” Quinn said. “That was also the big thing in pass protection. The Falcons have lost starting guards Brandon Fusco and Andy Levitre to season-ending injuries. Quinn said replacement starters Wes Schweitzer and Ben Garland don’t deserve all the blame for the struggles against the Saints. Beadles was signed on Oct. 30 and has worked at tackle and guard in practice the last two weeks. Sambrailo has been the team’s swing tackle. Quinn said he and offensive line coach Chris Morgan have discussed options on the line. Ryan also threw an interception. The team’s dire playoff outlook won’t affect plans to have linebacker Deion Jones play when he is available. Jones came off injured reserve last week after missing two months with a broken right foot. He was inactive against Dallas last Sunday and again was held out against the Saints in what Quinn described as a close call. The Falcons will try again to have Jones active on Dec. 2 against Baltimore. Freeman also still has a chance to return for the final two regular-season games. The Falcons also have lost both starting safeties for the season.